When the weather heats up, snowball stands pop up across St. Tammany Parish like mushrooms after a rain. There’s a stand every few blocks, each offering its own take on everyone’s summer cool-down fave. 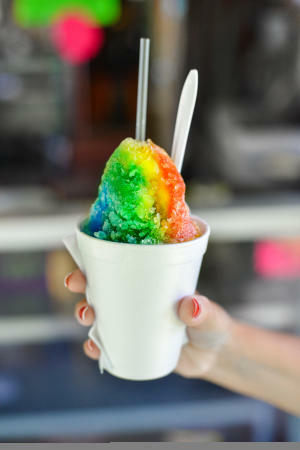 The sweet treats of shaved ice and flavored syrup may be called snow cones (or ices or granita) in some parts of the planet, but in Louisiana, we call them snowballs and we take them seriously. Don’t expect to choose from four or five flavors. Any snowball stand worthy of the name will offer at least 20 flavors and some will have scores, a dizzying list of sweet choices. Spearmint. Nectar. Cherry. Bubblegum (usually shockingly blue and tongue-dying, too). Coconut (colorless). Wedding cake. Orange. Strawberry. Raspberry. Blueberry. Blue Hawaiian. Lime. Tutti Frutti . . . Can’t decide? Most snowball stands will be happy to fix you up with a half and half, drawing a line in the ice to create a two-toned treat or even go full-tilt customized. Most snowball stands are seasonal, a welcome sign of summer. Most of us in this part of the world have sweet childhood memories of standing in line for a snowball with our families on summer evenings after dinner. Picnic tables are often provided. Be prepared to just sit a spell; driving with a snowball is about as wise as playing video games on your cell phone behind the wheel. Besides, it’s all about savoring the moment.